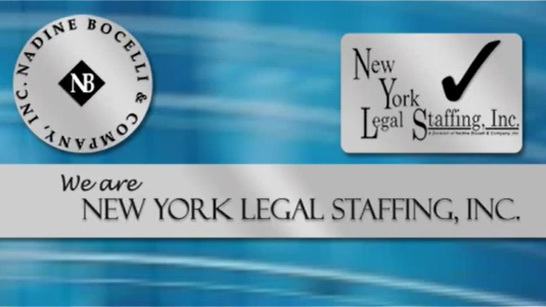 Legal Jobs In New York City – Nadine Bocelli & Company, Inc. – New York Legal Staffing, Inc.
Nadine Bocelli & Company and New York Legal Staffing, legal recruitment firms specializing in serving the legal profession with qualified candidates, is conveniently located in New York City. Our business address is 420 Madison Avenue in NYC, and is centrally located near Rockefeller Center and Grand Central Terminal and easily accessible to Port Authority and Penn Station. Our attorney and legal support staff recruitment firm assists BigLaw firms seeking to hire legal staff 212.644.8181, solo practitioners in private legal practice seeking to hire legal staff, startup law firms seeking to hire legal staff, small law firms seeking to hire legal staff, boutique law firms seeking to hire legal staff, mid-sized law firms seeking to hire legal staff, as well as the finest regional, national and international top revenue grossing law firms in New York City looking to hire legal staff in the employment market. Our legal recruitment firm also identifies employees for corporate in-house legal departments seeking quality legal recruiting services from an experienced legal employment agency located in metropolitan New York, New Jersey and Connecticut area. Please explore, find and apply to our available direct hire, temporary and temp-to-perm legal jobs located in the candidate career center legal job listings webpage www.new-york-legal-jobs.com or contact 212.644.8181 for further helpful information. Available online employment classified advertising and New York job postings available through our legal staffing search firm that specializes in serving the legal profession. These legal job listings are legal careers listed according to date, title, salary and general location and are solely provided for legal employment information to post daily legal job listings in New York, New Jersey Connecticut and are legal job listings designed to assist attorneys, law firm management, paralegals, legal assistants, legal secretaries, legal administrative assistants and additional legal job seekers. New York legal employment agencies specializing in servicing the legal profession, legal staffing agency, legal employment services, legal employment specialists, legal personnel agencies, legal recruiters and legal headhunter job listings in The New York yellow pages or the New Times and are provided by Nadine Bocelli & Company and New York Legal Staffing. Obtain the best legal job in New York City today through our legal recruitment firm.